Deepak Kesarkar, Maharashtra Home Minister, on October 24, 2018, said that the state would initiate “proper action” against the infamous Sanatan Sanstha, which has been accused of having played a role in the assassination of rationalists in the past five years. Through an investigative report, the India Today had exposed, on October 8, 2018, the involvement of Sanstha in also planning and executing several bomb blasts in 2008 and 2009 in Maharashtra and Goa. Kesarkar has said that this investigation will be considered as an “important piece of evidence”. He also noted that the state has sought the tapes of the broadcasted investigation from the India Today Group, and following adjudication of these tapes, “a proper action” will be initiated. However, this is not the first time that a government in Maharashtra has initiated an investigation, and interestingly, this is also not the first time that Kesarkar has said that the state will initiate an investigation. The Sanstha is a Hindu extremist cult that believes there will be a war that will be fought to establish what its founder Jayant Balaji Athavale calls “the Kingdom of god.” The cult is not just any other religious group, but is an extremely communal one, and it also contributes in the existing rightwing communal politics in the country. With the political patronage that the Sanstha has been receiving from Maharashtrawadi Gomantak Party (MGP) and Bharatiya Janata Party (BJP), it has remained untouched till now. The very structure of the organisation i.e. Sanatan Sanstha has not been registered as one organisation, but has been registered under different names. These “affiliates” carry on all the terror activities designed by Sanatan Sanstha, and make the investigation process strenuous. Going by what Kesarkar has said, the involvement of the organisation in the bomb blast cases will be investigated. The question now is, will all the organisations, like Hindu Janajagruti Samiti (HJS), Hindu Vidhidnya Parishad and others also come under the state’s scanner? In 2008, Sanatan Sanstha was named in the Madgaon, Thane and Vashi blasts. An investigative team of India Today spoke to Mangesh Dinkar Nikam and Haribhau Krishna Divekar – both sadhaks (follower) of Sanatan Sanstha – who were acquitted by the trial court 10 years ago in relation to the bomb blast cases in Vashi and Thane. They were captured confessing their direct involvement in planting the bombs on camera. Nikam confessed having planted the explosives in Vashi to scare people, who had come to watch Marathi play Amhi Pachpute – which depicted Hindu gods and goddesses in a bad light, according to the Sanatan Sanstha . Divekar confessed to possessing the explosives. 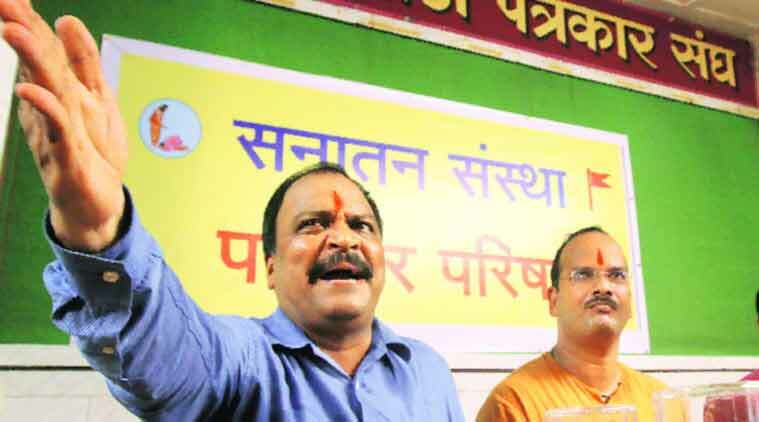 They also confessed that all the attacks were planned in the Sanstha’s ashram in Panvel. Most recently, this Hindu extremist group has been accused of playing the mastermind behind the political assassinations of rationalists Dr. Narendra Dabholkar, Govind Pansare, M M Kalburgi and Gauri Lankesh. When Dabholkar was assassinated in Pune in 2013, Sanstha was said to be involved in the assassination, but no investigation was ever initiated. Five years later, following another political assassination, of the journalist-activist Gauri Lankesh in Bengaluru, the Special Investigation Team (SIT) set up by the Government of Karnataka has arrested 15 Hindutva workers, all affiliated to the Sanstha and its affiliates. Despite these developments, the Sanstha and its founder are not brought under the scanner. It was when Maharashtra Anti-Terrorism Squad (ATS), following the clues from the Karnataka SIT, started seizing explosives from the activists-followers of the Sanstha that the pressure to ban the organisation on the state governments of Maharashtra, Karnataka and Goa as well as the central government increased. All the government officials inclding Kesarkar had cited lack of evidence as a reason behind their inaction. An organisation that was established in 1999, has grown into a full-fledged terrorist outfit in such a short period. This is not the first time the Sanstha has been accused of terror activities, but ever since its inception, the organisation has been pointed fingers at. A report in the Livemint had stated that the local population in Ponda – where the headquarters of the Sanstha is situated – was always skeptical about the ashram. According to this report, Vasant Bhatt, 52-year-old priest of the Ramnathi temple, which is in the vicinity of the Ashram, located the first fault lines in 2009 when the Sanstha’s involvement was suspected in the Margaon blast. In 2011, the then Chief Minister of Maharashtra, Prithviraj Chavan, had sent a detailed report to the then Congress government at the Centre. The central government, however, had said that the report lacked sufficient evidence. The Chavan’s government did nothing about the “lack of evidence”, and now in 2018, the BJP government also is citing “lack of evidence” in the case. Kesarker, however, has now accepted the India Today investigation as an evidence, and has mentioned the possibility of action against the organisation. As mentioned earlier, this is not the first time the BJP home minister is talking about action against the Sanstha. In August 2018, as the activists started demanding a ban on the organisation, Kesarkar had said, the state has appealed to the Centre. The central government, on the other hand, denied receiving any such appeal from the state; and later Kesarkar himself denied having made any such appeal. The SIT of Karnataka and ATS Maharashtra have been arresting people, and naming them in the cases of four political assassinations. It is important to note that none of these investigative agencies has filed any chargesheet yet. SIT had filed its first and only chargesheet in May 2018. Since then, the agency has arrested 12 others, with the recent arrest of Vasudev Suryavanshi on October 12, 2018. Suryavanshi was first arrested by the Maharashtra ATS from Jalgaon in connection with an arms haul case on September 10, 2018, and later by the CBI for his alleged role in the murder of Dr. Dabholkar. In October, following the revelation by Amole Kale, the chief accused in Gauri Lankesh Case, Suryavanshi – a former member of Sanatan Sanstha – was taken into custody by the SIT. These chargesheets if filed, will act as important evidence against the Sanstha that would make investigating the organisation and its founder non-negotiable. The only question here is, why the delay?